The medulla oblongata is the undermost portion in the stem of the brain, and is measuring approximately 3 centimeters long. Its structure is bulbous, and it is attached anteriorly in the pons. It is also connected posteriorly in the spinal cord. Medulla oblongata is situated at the same level as with foramen magnum. When it is viewed externally, it would look similar to the spinal cord except for the pyramids. On the other hand, the pyramids seen in the spinal cord are elevated elements having a triangular shape. 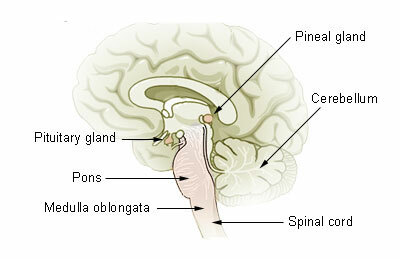 The space near the medulla oblongata is the fourth ventricle, the continuation of the spinal cord’s central canal which is located posteriorly. The medulla oblongata is composed of a white matter, vital nuclei and also communication tracts which go up and down along the spinal cord, and in other parts of the brain. It also contains the fiber of the tracts that intersect in the other side of the brain. Such design makes it possible for the brain to transmit information to the other side of the body when necessary. The gray matter within the medulla oblongata houses a diverse number of vital nuclei reserved for the purpose of sensory relay and for the cranial nerves as well. Inside the fourth ventricle also lies the nucleus ambiguous and the hypoglossal nucleus. It creates the central structure that brings the glossopharyngeal accessory and hypoglossal nerves forth. The vestibular nuclei forms the vestibulocochear nerves, and on the medulla oblongata’s individual lateral section lies the vagus nuclei which creates the vagus nerves.